Are you ready to celebrate New Year’s Eve? A few more hours and we will say goodbye to 2013! We dedicated an entire article to New Year’s Eve in Florence, which this year will be celebrated in 6 different squares offering free concerts. You can find all the details here. The celebrations of New Year’s Eve in Siena begin in the late evening in the streets of the historic center and then, from 9pm, move to the beautiful Piazza del Campo. Here, several artists from the music and dance schools of Siena will perform. From 10pm to 11pm, the square hosts a tribute band of Pink Floyd and from 11pm to 3am a DJ set will animate Piazza Matteotti. For other details you can check the Facebook Page Happy Light Year Siena. In Lucca, the New Year is celebrated in Piazza San Martino, where from 10pm to 3am you’ll find dance music first and pop music later with the Abbadream tribute band. A curiosity: Lucca will celebrate two toasts, one at the stroke of midnight and another 18 minutes later, at the “Midnight in Lucca”. On December 31, starting from 5:30pm the streets and squares of Pisa will be filled with music, lights and shows. Before midnight some Chinese lucky lanterns will fly from the Arno river, while Piazza Garibaldi will host the toast with the Mayor and Deputy Mayor of Pisa. At Midnight at the Ponte di Mezzo you can admire the show of water, lights and music. From the afternoon until 3 in the morning, there will be shuttle buses to get visitors from parking areas to the center. For more information, see the official website of the Municipality (in italian). In Pistoia, all city museums will be extraordinarly open from 6pm to 11:30pm on December 31. At 9pm, animation in the streets of the historic center will start with the “Big Parade” and at 10pm the Sala Maggiore will host the “Pistoia Gospel Singers” (it’s a free event, but reservations are required). At 10pm in Piazza San Bartolomeo there will be musical entertainment by the DJ Civinini, while Piazza Duomo hosts traditional Southern Italian music at Midnight. The New Year’s Eve in Arezzo is in Piazza Annigoni where from 9:30pm onwards there will be music, DJ sets, acrobatic dance and a midnight toast. 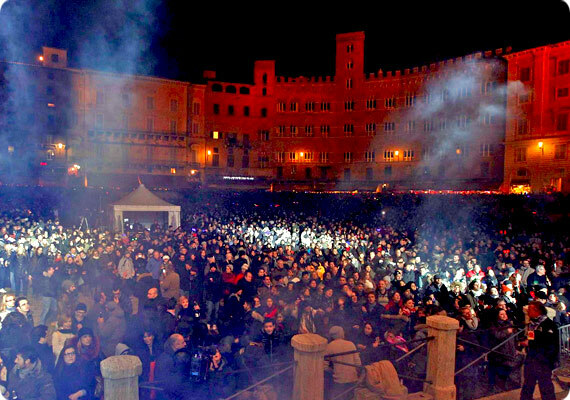 Grosseto celebrates the arrival of 2014 in Piazza Dante with music: a DJ set from 10pm to 11pm, then the tribute band “Great Queen’s rats.” The toast at midnight. More details on Facebook (in italian). To all of you our Best Wishes for a Happy 2014!